Emily Parsons-Lord asks us to picture the air in our imagination. What do we see? Empty space, clear blue sly or trees dancing in the breeze? We tend not to think about the air at all, only when there is some unpleasant sensory intrusion, like an unpleased smell or seeing smoke. Air always there and is immediate, vital and intimate. 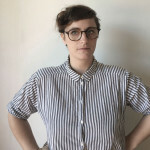 Emily Parsons-Lord is an emerging cross-disciplinary artist whose practice is informed by research and critical dialogue with materials and climate science, through investigation into air, both materially and culturally. Exploring air as both a dynamic physical material and an amorphous subconscious site to project imagination, as well as consider scale between the individual and the planet, her work queries the cultural understanding of Anthropogenic traces in air: “Anthropo(s)cenery”.